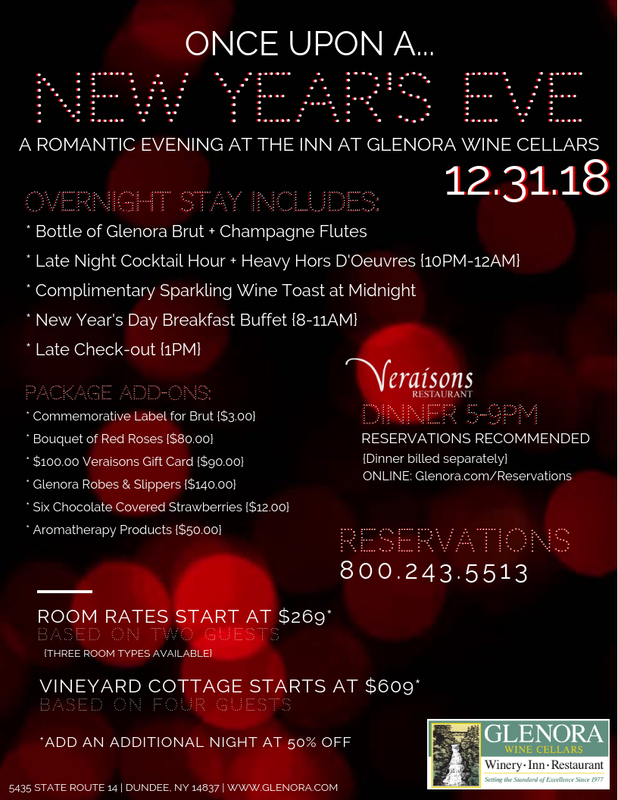 Ring in 2019 with your special someone at the Inn at Glenora Wine Cellars and Veraisons Restaurant! Our New Year’s Eve package includes a variety of elements perfect for a romantic and relaxing celebration, with additional add-ons available to make it extra special. Overnight stay includes a bottle of Glenora Brut and champagne flutes, late night cocktail hour with heavy hors d’oeuvres, sparkling wine toast at midnight, and a breakfast buffet and late check-out on New Year’s Day. Room rates start at $269. Call 800.243.5513 for reservations. Learn more at Glenora.com/Inn/New-Years-Eve!